SINGAPORE employees' unwillingness to move outside the country could put a strong barrier to their career advancement, even as the rapid globalisation of Asian companies provides more opportunities for global mobility. According to a Towers Watson study, 56 per cent of local employers said that the obstacle to deploying employees globally is their reluctance to move, followed by cost management constraints, which received 43 per cent of the vote. Though the number of local employees who felt that they have been working longer hours than normal in the past three years is the highest at 57 per cent, the group also reported the lowest number (27 per cent) to have reduced the days taken off work, as compared to the Asia-Pacific region. More than four in 10 Singapore workers said they feel they have to join another group to advance their careers, and of that portion, more than half are willing to relocate overseas to do so. Only 14 per cent feel they have advancement opportunities, compared to the global average of 27 per cent. 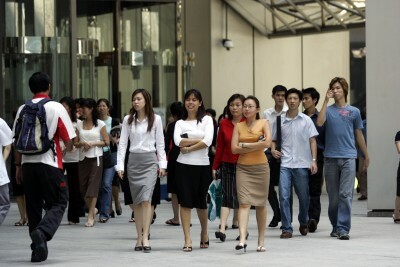 Thirty-four per cent of Singapore employees said they are likely to leave their current employment in the next two years. Views on what retains staff differ between employee and employer. They were in tune for the top three factors of base pay, career advancement and relationship with supervisor, but views diverged on trust in senior leadership, job security, work and incentives. Singapore employers generally have fewer problems retaining talent, the least of all with recent university graduates, as compared to the overall average in Asia-Pacific. Likewise, only 8 per cent experienced problems in attracting recent grads, significantly lower than the regional average of 24 per cent. Attracting skilled employees was not as easy though. Over seven in 10 respondents experienced problems in luring top-performing, high-potential and critical-skill workers. "We find that many employers are not taking advantage of opportunities to attract, retain and engage key talent by offering a value proposition, work environment and the total rewards programmes that are most important to them," said Asia-Pacific leader of rewards at Towers Watson Dhritiman Chakrabarti.